Students across the nation are currently experiencing or will soon experience new forms of assessment involving a wide variety of technology enhanced (TE) items. In an effort to assist districts and charters to prepare students for the next generation of assessments, ATI is introducing the new forms of assessment in the context of digital curriculums that support instruction aligned to new and changing standards and provide opportunities to learn to respond to new forms of assessment. Within this context, ATI has developed several distinct types of TE items to be introduced in Instructional Dialogs. These include the: multi-part item, selectable text item, sequencing item, expanded selected response item, performance-based item, and customized TE item. The customized TE item can be used to build a broad array of item types. Moreover, the ATI customized TE item type can be used to rapidly emulate new item types that may emerge in the future. TE items are available in various subjects for kindergarten through high school with ATI item construction occurring at an accelerated rate of producing over 400 new TE items every month. TE items can be incorporated into formative, benchmark, pre- and post-tests, dialogs and in digital curriculums. Corrective feedback is available for many TE practice items presented in dialogs. Additionally, item level psychometrics can be established on the Galileo TE items on a continuous basis. 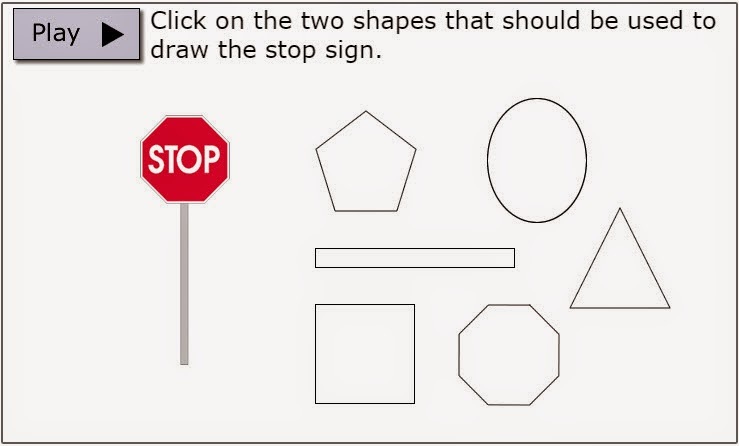 A sample of a customized TE item for kindergarten containing an audio recording can be viewed at: http://www.ati-online.com/testnew/G5StopSign/G5StopSign.html or by “Control” “Click” on the following graphic. Technology enhanced item - click to play the sample item. The development of ATI item types has been informed by SBAC and PARCC examples as well as by information from state departments of education. At a more basic level, they have been influenced by the new waves of technology forging the rapidly developing movement toward digital education. Consequently, the ATI TE item types reflect the wide range of TE items likely to be encountered on statewide assessments such as SBAC and PARCC. TE items are designed to accommodate different levels of cognitive complexity. Those items that call for a single correct answer to a question requiring recall or recognition memory are used to assess knowledge and skills involving low levels of complexity. Items requiring the application of multiple interrelated cognitive processes are used to assess knowledge and skills reflecting high levels of cognitive complexity. The concept of cognitive complexity has important implications related to test-taking skills. The importance of test-taking skills derives from the lack of student familiarity with the new items. Lack of familiarity may increase the initial difficulty of TE items, which is why we believe that it is useful for students to become familiar with TE item types in an instructional environment. Instructional Dialogs provide the kind of instructional environment needed to introduce TE items. To learn more about the benefits of technology enhanced items and digital curriculums.